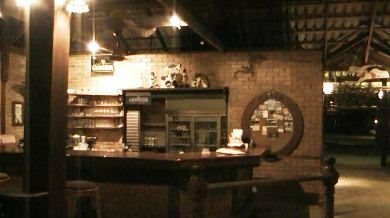 If you enter from the road (Jalan Pantai Cenang), there is a narrow passage by the side of Sunset Beach Resort which leads down to this bar & restaurant at the end. A section of the place extends down to the beach. 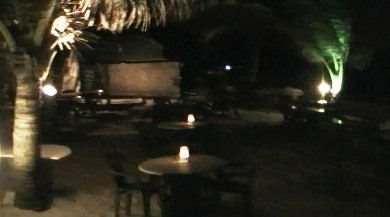 So if you are walking along the Cenang beach, you will see beachside tables and swaying palms next to the Sunset Beach Resort, and you know you have reached Oasis. You can walk up from the beach and take a table. But at the main entrance you will see the menu displayed. It's primarily Indian food and also some western fares. While there is a set menu, there is also a menu that says 'Less Spicy Menu'... after all the Indian dishes are supposed to be spicy, although an Indian would vouch that preparations here are far less spicy than they actually are back in India, probably because they don't want any foreign tourists to get scared away for spice. After the main entrance there is an indoor bar area. The bar counter seems to double up also as the cash counter. 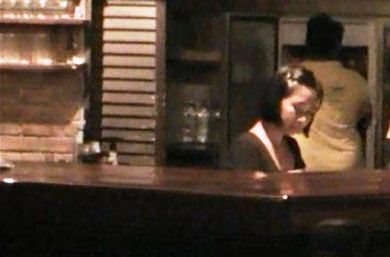 A lady seated at the counter serves the drinks who sit on the bar stools around the small counter. Inside the decor is a bit rustic wit wooden finish. There are few tables scattered around and also a pool table. These indoor dining tables get busy during the lunch time when outdoor seating is not an option due to the scorching sun. But after 6pm, the main attraction is outside in the sand which stretches all the way down to the beach. There are rows of tables laid out right on the sand each with two or three chairs. The tables at the end that face the beach are in high demands. Those are the coveted seats for watching the wonderful sunset while having a beer or cocktail. In the evening when the it gets dark, the tables are lit up with candles. The few palm trees around are also lit up with colored lights. The ambience then becomes perfect to enjoy a drink while watching the foaming waves pounding a few yards away. They also put on some jazz or reggae music in the background which further adds to the atmosphere. This is a mid-scale restaurant. Drinks are quite affordable (an average cocktail would cost around RM16). You get Guinness Stouts here as well as Lavazza Coffee. The food is also reasonably priced given the location of the place. However they are not inexpensive either. 1) Food: Overall food preparation is average. Nothing exciting, but not bad either. Some of the nice Indian dishes you can try are the Tandoor (earthen woven grilled) items like chicken tandoor, chicken tikka etc, or even the mutton curry with naans (flour bread) or rice. However it's better to avoid the gravy items here. We didn't like the green curry items at all. Other nice items to go for are Fish n' Chips (really nice), the burgers with beef fillings, chicken fried rice and even the bolognaise. 2) Service: Can be decent to horrible. While in general the staff are non interfering, relaxed and attentive, in one occasion an young lady staff disappeared and we ended up with no dinner that evening. After a couple of beer, we ordered for our dinner late that evening (around 9:30pm). Having waited till 10:30pm for our food, I went up to the counter and inquired. No one seemed to know and the young lady staff who took the order could not be traced. And the lady at the counter told me point blank on my face that the kitchen was already closed and nothing could be done about it. While 'no dinner' was annoying enough, an unpolished behavior from the lady at the counter was completely unacceptable. I wanted to meet the owner, but was told that he leaves in Kuala Lumpur. I found it hard to believe it although could never verify that. We left the place with a heavy heart that evening and finally had our dinner at Raj Darbar, another small Indian restaurant on the road close by. The lady at the counter who behaved rudely. 3) While the tables and seats on the sand are quite nice and offer great views, be careful about the sand flies that tend to bite. So carry some insect repellent. There are lots of dry leaves and weeds around which need to be cleaned up more frequently than being done now. 4) Will I come again? Yes I will, but probably to enjoy a drink over the sunset and one more for the ambience. I would rather have my dinner elsewhere if I'm having it late. Opens daily at 12:30pm. Serves lunch from 1pm - 3.30pm; Dinner from 6pm - 10.30pm. Note that once the kitchen closes, you won't get anything to eat although you can keep getting drinks till late hours.